A high quality rubber stamp with an image of a lighthouse on. Great for scrapbooking, making cards, tags and personalising paper products! 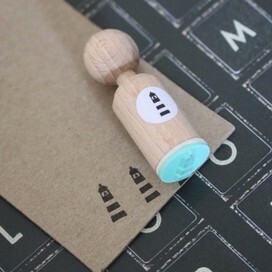 The stamp pad area measures approx 1 - 1.5cm across and the wooden stamp length measures approx 4cm long. Please note these stamps are MINI. Please check the size before purchasing. Please also note that due to the nature of producing the stamps may not be completely accurately aligned in the centre of the circle.